Handbags...I love a good handbag,and I have found three wonderful handmade bags in the past several weeks. The first one was only $14.99 by an eBay seller. When the seller was making and listing bags, she had some wonderful bags made with Vera Bradley and Michael Miller fabrics, as well as shabby chic styles at the time of my purchase. Sadly, nothing has been listed in several weeks and she isn't selling anything at this time. 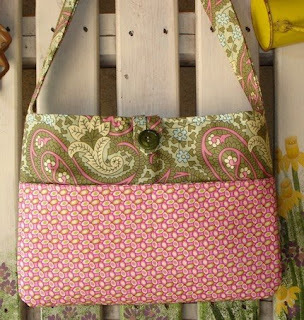 This wonderful quilted bag is stitched beautifully. It features the classic Shabby Chic colors of robin's egg blue and soft rose. The handles have soft coordinating polka dots on the other side. The button is made of a vintage rhinestone that gives it such a unique feel. I received this at 11am in the mail and had received 3 compliments by the time I picked my son up from preschool at 2:30! The second great bag I purchased was on my favorite site, ETSY. I have always loved Amy Butler fabric, but I have been seeking ANYTHING Amy Butler the past couple of weeks. I just love everything she does. I found a great handbag by Etsy seller brezomayo. 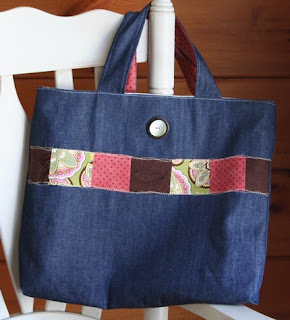 It is made of a dark wash denim and has different Amy Butler fabric pieces in a patchwork design. I paid $28 for this one and I use it every couple of days. The button is really pretty, too! It is mother of pearl atop a vintage brown button. I really adore this bag. The interior features quilted cotton and a pocket. The seller was EXTREMELY friendly and the workmanship is great. Check out the other wonderful pieces in brezomayo's Etsy shop today! My third handcrafted bag is my most favorite! It was $24.00 and also found on Etsy. I just bought this last Thursday, and I received it in less than 48 hours! Now that is fast. Seller gizmos made this beautiful piece out of various Amy Butler fabrics, all of which are my favorites in the pinks with bursts of green and blue. I have worn this one ever since I got it and I just LOVE it. It was made with great care and it is just a gorgeous bag! You'll find it in the last picture. 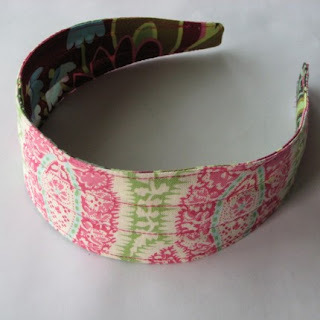 While we're talking about Amy Butler, I have to mention a great headband from the Etsy seller Precocious. I bought a pink paisley headband and it looks so pretty! I wore it Saturday with a fitted tee and walking shorts. It held back my chin-length bob and was comfortable. It's not one of those headbands that squeezes your head so badly that your jaw aches. It is just really pretty. I actually didn't notice it until I had it next to my new Amy Butler handbag, but this headband has the same fabric as the interior of the purse I bought from gizmos on Etsy! While sharing these finds with you, I cannot emphasize enough what a great community Etsy is. I have met some wonderful women on Etsy (and men), and I have NEVER once been disappointed with a purchase. My friend Jennifer, owner of Aloha Coconut also has decided to open an Etsy shop to go along with her dot.com site. I am happy to see her there as well! By the way, have you tried Aloha Coconut before? Now is a great time, as she has a sale code! If you enter code HAPPYBIRTHDAY at checkout on her dot.com site, you will save 15%. My other favorite Etsy shop? MY OWN, OF COURSE! I think it was May 5th that I returned to Etsy and I do not think I have ever been as content. I am loving being back, and thrilled to have met some great new customers. My shop is "my own" thing outside of being a mommy and a wife and it is FUN again. I haven't felt this way in a long time! kzm Facial Care Boutique also has some old favorites back as well as new items! Today I listed my brand new organic hand cream. It is rich, but not greasy, and has antioxidants and DMAE. The vitamin C in it will help to fade brown spots. I love it and I know you'll simply adore it! All Chic & Green Beauty Blog readers will receive a free gift with purchase just by mentioning you read this in the checkout notes. Valid all month!